Planning a trip to New Hampshire's Lakes Region? Discover some of the most popular summertime activities and events that our area has to offer! With so many exciting things to do every day of the week, it's no wonder so many NH residents and people from all over the world choose to come here during their summer holiday season. Enjoy panoramic views while relaxing on New Hampshire's beautiful lakefronts, eat out at a few of the most talked-about restaurants in town, enjoy musical performances from renowned artists, but most importantly, be sure to catch the top summer events in the Lakes Region of New Hampshire! Integrate the arts into your vacation this year at Interlakes Summer Theatre, a "feel good, broadway style musical theatre." This talented bunch of performers delivers the perfect opportunity to ditch the screens and immerse yourself in a different time and place entirely. Whether you're a theatre veteran or a first-timer, the five different musicals performed over the course of the summer are sure to dazzle. You and your friends and family are sure to find something to love at the Interlakes Summer Theatre. This year, choose from "The Wiz," based on "The Wonderful Wizard of Oz," to "Miss Saigon," by the creators of "Les Miserables," along with many others. Located at the Interlakes Community Auditorium in Meredith, the theatre is convenient for all Lakes Region vacationers. They even have a Children's Theatre; be sure to check out their performances with your little ones! Weirs Action Committee is making history this year by celebrating Independence Day the very moment it comes around: 12:01 a.m.! 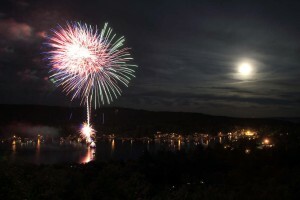 Gather your family and friends at Weirs Beach to ring in this year's Fourth of July with a stunning display of fireworks. For those who'd rather be snoozing by midnight, additional fireworks shows will be held on Friday night at 10:00 p.m. from the shores of Endicott Park at Weirs Beach. You could even take the family on a fireworks cruise- the view from a boat in Weirs Bay is especially lovely, with the fireworks exploding almost directly overhead. Come enjoy the lively festivities and commemorate America's birthday on a gorgeous sandy lakefront beach at the annual event sponsored by Weirs Action Committee. Come down for an exciting afternoon on the boardwalk and finish the night off by watching the spectacular array of the Weirs Beach fireworks! Ready to use your imagination, let your creativity come to life, and build a fairy house? Yep, that's right: Build a fairy house! Have a blast with the kids at the fourth annual Fairy House-Building event from Wolfeboro Area Children's Center. Located in Wolfeboro's Cate Park from 10 am to 2 pm on July 5th, put your crafting skills to the test with your Lakes Region neighbors. All supplies used must be natural (materials found in nature), so it's a great way to get the kids outside, collecting pebbles, twigs, leaves, grass... all kinds of things to make your fairy house unique.